I’m reading this fascinating book right now by Jonathan Kauffman, called Hippie Food: How Back-To-The-Landers, Longhairs, And Revolutionaries Changed The Way We Eat. He points to those hippie types’ affection for yogurt, which eventually crawled its way into the dairy aisle as a food staple for the rest of us. When I was 12 I ordered the Dannon Yogurt Diet pamphlet through Seventeen magazine: Unsurprisingly, the meal plan consisted of mostly yogurt. I believe if you had 40 or more pounds to lose, you were only allowed Dannon plain; 20 or so, you could move on to Dannon’s lemon, vanilla, and coffee flavors. Only when you were nearing your goal weight could you then dive into Dannon’s delicious fruit-on-the-bottom variety. Decades later, it’s safe to say that the yogurt market has exploded. Fortunately, Kate Bernot has already painstakingly gone through all the various different exotic yogurts for us. But all yogurt manufacturers are now compelled to get even more creative to entice us to buy their products: whipped, mix-ins, sprinkles are standard. 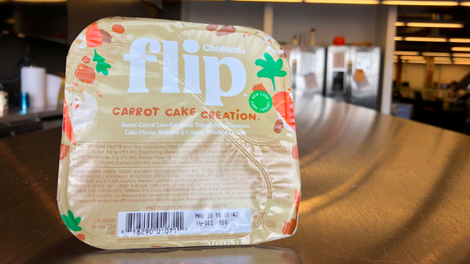 Last year my beloved Chobani even came out with a whole line of dessert-themed yogurts, but I hadn’t really noticed until Chobani Flip’s Carrot Cake Creation peered out at me from the dairy aisle shelf (other flavors in the line include Perfect Peach Cobbler, Key Lime Crumble, and Apple Crisp Twist). Although nicely carrot-cake spiced, Chobani keeps the base yogurt not overwhelmingly sweet, which made the cream-cheese-reminiscent “frosting chunks” a nice addition and not over the top. For the calorie-conscious, the 200-calorie count made the treat seem less indulgent—if a little unfulfilling. (I failed in trying to make the package my entire lunch.) But for an occasional snack, it may do quite well; it certainly isn’t going to make me forget about carrot cake, but it probably isn’t going to make me want to take a nap afterward as a thick slice of carrot cake might do. So I guess I’m a picky yogurt eater, due to my long history with the product. I think most of those elaborate dessert-related yogurts are ridiculous (I’ve found every single yogurt I’ve ever tasted that has chocolate in it to be gross without exception, yet I still keep trying for some reason). 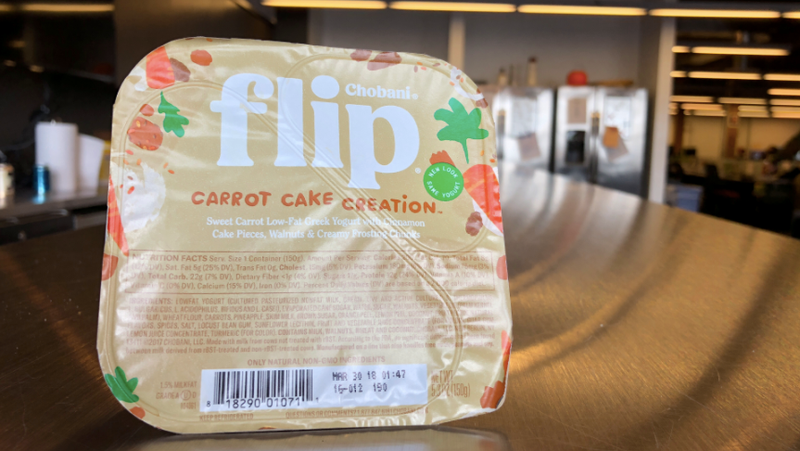 Unless a company like Chobani pulls off a reasonable, almost healthy version of one of my favorite desserts—in which case I’m totally on board. What’s up, Key Lime Crumble.